Killer Characters: Character needs a hobbby & GIVEAWAY! Character needs a hobbby & GIVEAWAY! 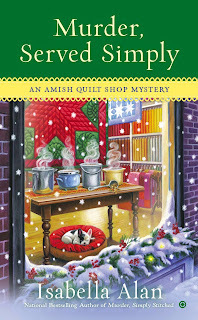 My wife and I moved to Holmes County, Ohio from Dallas to be closer to our daughter Angie, who moved here a couple of years before us to take over her Amish aunt’s quilt shop, Running Stitch. I took early retirement to make the move. I’m thrilled to see my AngieBear so often now that we live so close. However, I must admit I’m at loose ends. I have worked for over thirty year as an executive in a high-powered office, and now… nothing. I have absolutely nothing to do except Sudoku. There is only so much Sudoku a man can do without losing his mind. Of course, my wife Daphne has had no trouble filling her time. She had made friends at the local beauty parlor and is already volunteering all over the county to better the community. In fact, this fall she is helping Angie with a library book sale. To be honest, I don’t think AngieBear is all that happy about being roped into helping with the book sale, so she is thrilled to turn the whole thing over to her mother. 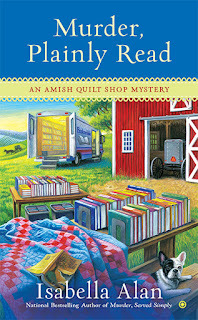 Or she would have been thrilled, if she hadn’t found dead Amish man on library’s bookmobile. Knowing my daughter she will investigate the Amish man’s death with James Mitchell, her sheriff boyfriend, shaking his head the entire time. My wife might stick her nose in it too. But not me. I want something to occupy my time, but I don’t really want to be chasing killers. Honestly, I don’t want my daughter to be doing that either, but there is no point in arguing with Angie when she feels what she is doing is right. She gets that stubbornness from her mother. Don’t tell her I said that. So if I’m not going to solve crimes, what am I going to do? I’m open to hobby suggestions. 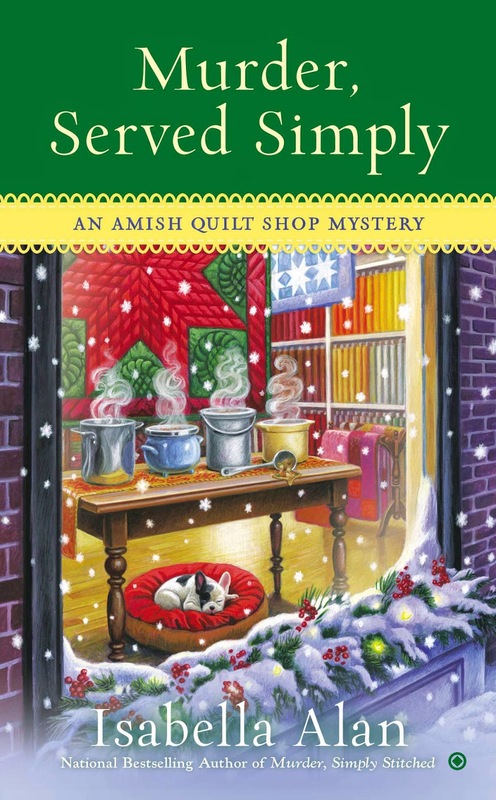 Leave a suggestion of a hobby that I should try and your email address in the comments below for a chance to win a signed copy of Murder, Served Simply (Amish Quilt Shop #3). Giveaway ends Friday, November 6th at 4pm. Winner will be notified by email. 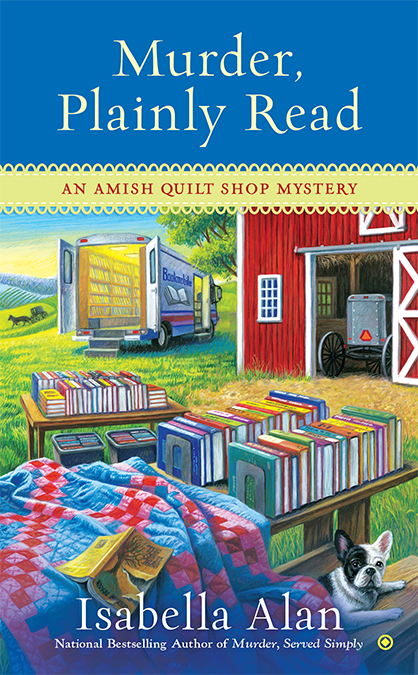 Oh, and you if have read any of the books in the Amish Quilt Shop Series please consider posting a review on Amazon, B&N, or another retailer site. Those really help to keep a series going! I love refinishing furniture and would suggest it as a wonderful and rewarding hobby! Well, since you mentioned a library, you could catch up on all those books you never had time for and write reviews to share with the world. Become a Blogger/Reviewer. You'd then have a reason to do some travelling to the various read/author conventions like Bouchercon and Malice. I mean it's just a suggestion, and I'm tossing it out at you. I think you could make things from reclaimed objects---that would leave plenty of room for creativity. Oh no, a body in a bookmobile?? That is just wrong. All my hobbies end up to be reading, but I think you may need something more active and hands on. I'll go with the volunteering option. And you're right, stay away from the murder investigation, probably going to be dangerous! Working with a jigsaw, lots of patterns out there and you can even make some money off the end product. It would of course involve a work area that would hold the saw, and an area to paint the finished product. I do hook rugs every so often they are not that expensive and are fun to do for me anyway. kamundsen44ATyahooDOTcom. I suggest building doll houses or wooden toys. Hi, Kent. Remember, there's nothing wrong with a man knitting. Both of my grandfathers were knitters. If you like working with wood, why don't you build quilt tables and Amish style yarn swifts? My husband just built me a swift, and it's wonderful! I enjoy jigsaw puzzles, reading and crossword puzzles! Genealogy is a wonderful hobby. He would learn about his family (maybe some skeletons or villains in his own family tree), learn history, and maybe find his own line of Mennonites (as I did)! Remodeling a house would be fun! Scrapbooking and making cards is a good hobby. I think a great hobby would be bird watching or fishing. Volunteering would be great too, maybe the local food bank or hospital. How about being a driver for the local community? There are so many ways to fill the days. Knitting is a good hobby as well as baking. I think you should try geocaching. It's a great outdoor activity that takes you places you probably never knew were there. Basket weaving, rubber stamping, jewelry making and reading are all great hobbies. Since your daughter owns a quilt show. Learn to quilt. This will give you more time with her. Scrapbooking -- you could use pictures that you've taken over the years. Woodworking -- make a bookcase or a quilt rack. Pet sitter -- take care of Petunia and Oliver, etc. I already have the third book but maybe if I win I could get the first one? I don't have that one. volunteering. surely your executive skills could be put to good use by some needy organization. or reading, jigsaw puzzles, photography, astronomy. Needlepoint is a great hobby. Knitting is my favorite & the needles might come in handy. Knitting and crocheting, reading, bird watching are all great hobbies. jig saw puzzles are relaxing, and give a person time to think...and ponder,,,I work one, maybe 2, over the whole winter. My biggest hobby is reading. I really don't do much else. After reading I would suggest photography. Hey Kent! Why not build WWII models of tanks and vehicles like my husband does. It is labor intensive but, if you take your time and pay particular attention to detail, you'll have duplicated miniatures of some of histories finest machines. I love your series Isabella, I've read them all except for your current release. Thanks for the chance to win a copy! Considering Kent's high-powered past, why not run for mayor of Holmes County, Ohio, since the pay is probably slim; and his ideas could benefit the community. He could be like Martha Tinsdale, the mayor in The Good Witch series. Digital photography, family history,tennis, Golfing, reading , bocci ball, exercise are great hobbies. Men would also enjoy woodworking and refurbishment of furniture. Seascapelife (at) gmail dot com. I think one of the best hobbies I've found is oil painting. Everyone sees beauty through a different angle and no matter what you do it will be an original. Age doesn't matter, look at Grandma Moses. You can also paint and sip a fine glass of wine too. How about genealogy. That can get pretty involved too. I like the feeling I get from furniture refinishing. 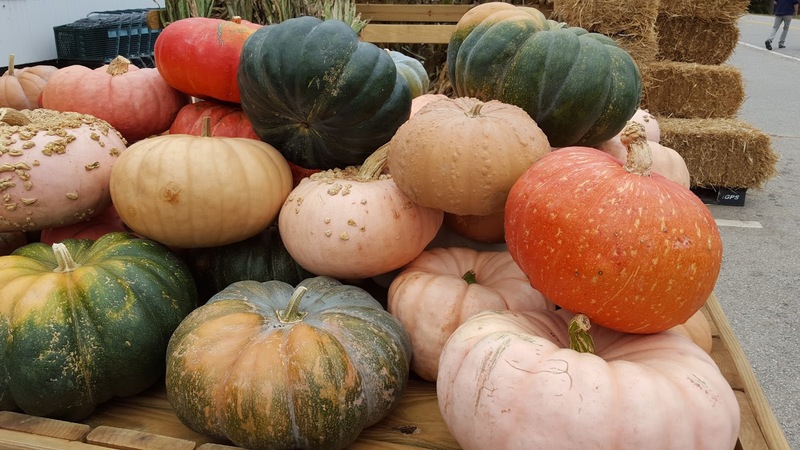 Try volunteering at the local hospital, gardening or woodcarving. Thanks for the chance to win. I love counted cross stitch! You should try it, it's very relaxing after a long day! Thanks! How about teaching kids and/or adults to read. That would be a worthwhile thing to do to keep you busy. It's not a hobby but a great volunteer position. As a hobby, you could make those crazy wooden lawn cutouts that people put in yards.